As summer winds down and we are now in the meteorological autumn, the bees are getting ready for the coming winter. Pollen and nectar sources are winding down, but in my yard, a couple of different agastache plants are still blooming and the bees are loving them. In my front yard, the Coronado Red Hyssop (Agastache Pstessene) has been booming this summer. This plant has small tubular flowers. After a few years of just being small 2 foot plants, this year they have grown to over 7 feet high. We’ve had a pair of humming birds that have been visiting for the past month or so and the bees are there in full force too. Out at the back of the bee yard, I have a couple of different agastache plants – the Giant Hyssop (Agastache foeniculum). These flowers are more like a mint cluster – not tubular and the bees just love this plant. There are still some cone flowers blooming and sunflowers all over the county. The blue mist spirea is almost done – I plan relocate a bunch of the little seedlings popping up in my lawn-to-garden project next spring. This year, I have a volunteer sunflower in that garden that has done magnificently despite me never watering it. 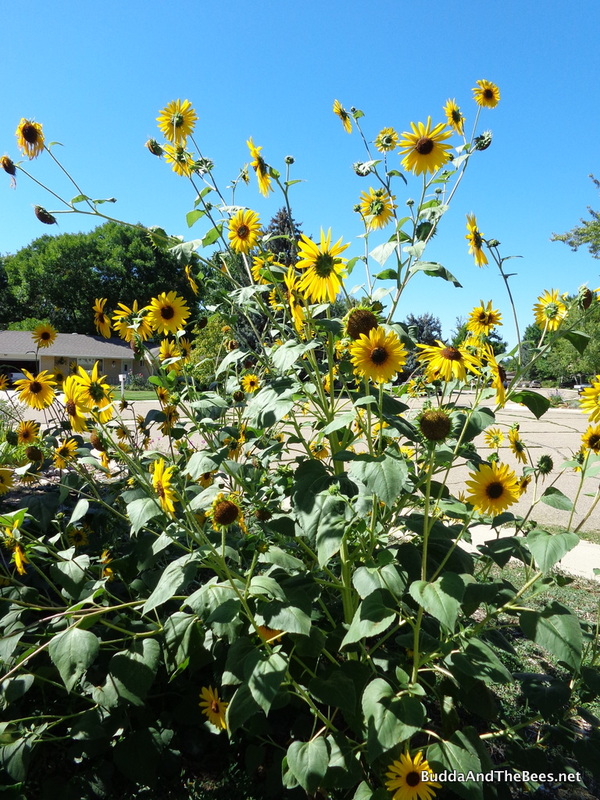 Sunflowers in my new lawn-to-garden area. 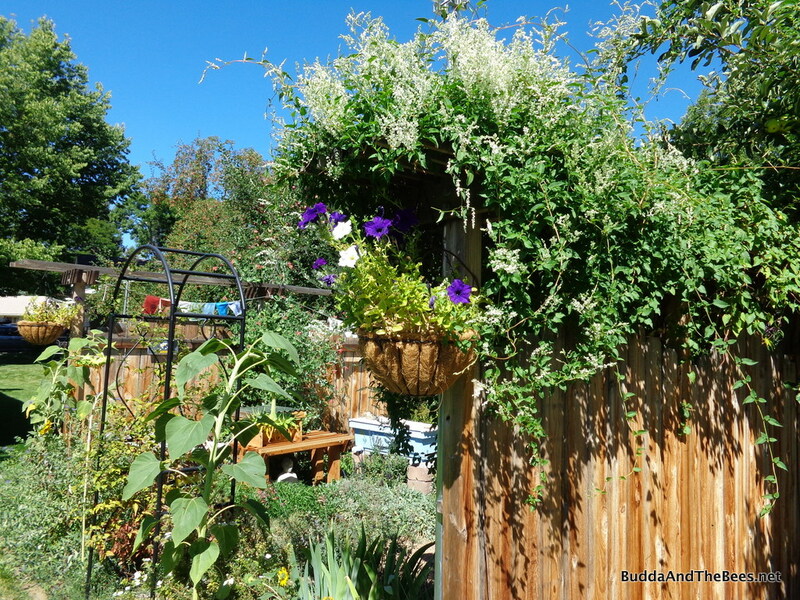 In the beeyard, the silver lace vine is in full bloom, but it doesn’t seem to be a big hit with the honey bees. I see wasps and native bees on it, but very few honey bees. I did my last full inspections a few weeks ago, but decided to take advantage of the nice Labor Day weather to check into the hives in my backyard and neighborhood one more time. All except Laura’s hive are still chock full of bees and seem to be doing well. Laura’s was recently requeened and the new queen seems to be slow to start building up new brood. But, there were new stick eggs and larvae, so maybe she’s just getting into her groove. I gave the hive a frame of brood from BnB1 a couple of weeks ago and today, we could see that some of the dark Carniolans from BnB1 had hatched and were mixed in with the pretty golden Italians. Today, I gave Laura’s hive a couple of frames of honey from BnB2 so they can concentrate on raising bees. They have plenty of pollen and honey now – they just need some more bees. I’ll have to keep an eye out for wasps and other bees trying to rob the hives, but they seem capable of fending off any attacks. I reduced the entrance on Laura’s hive since they have fewer bees, but will keep the others open full unless I see signs of robbing. I’ll try to do one more quick check of Sarah’s hive and the Left Hand Lang next weekend, but for the most part, my summer beekeeping task are almost over. The honey has been harvested, the hive health has been checked and now it’s time to watch and wait. Glad Laura’s hive is picking up. Hope she builds up enough before winter, but it sounds like you have plenty of resources to go around.